Scott Switzer’s painterly sensibility is taken with moral issues—indeed, to the point where he has put on the mantel of Jewish culture, its ethics and symbolic vision. As an artist working in the American West, he has exiled himself to places where the physical beauty of his surroundings might well catch his creative attention. Yet his imagination remains literary and ethical, filled with the accouterments and emblems of Jewish religious life. This might seem to some idiosyncratic to a degree; however, the imagery is remarkable—it results from Switzer’s outstanding attention to an idiom that projects a fine morality based on a culture he has chosen rather than having grown into. Jewish religion involves laws ancient in the making, yet which nonetheless have currency today of a deeply meaningful sort. Switzer’s spiritual, intellectual, and emotional involvement is so deep it can be said that he has transformed his imagination into one of time-honored meaningfulness, premised on the idea that ethics and cultural imagery can merge, establishing not only something seen but also something thought—a philosophy for the difficult currents of our time. 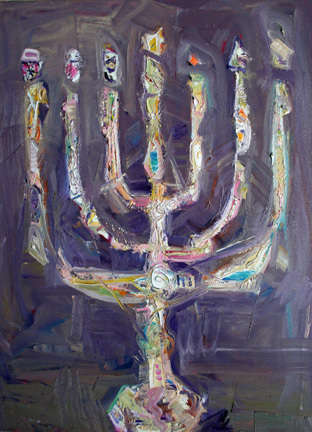 In Switzer’s hands, then, we can see that something as simple and moving as a menorah will enact its contact with spiritual insight, in a way that does justice to its larger meaning in Jewish history. Jonathan Goodman is an editor, writer and critic of contemporary art based in New York. 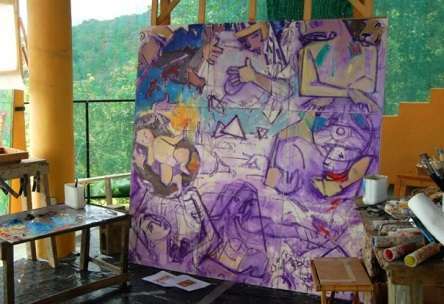 He writes for several publications, including Art in America, Art on Paper, Sculpture, and Art Asia Pacific. Goodman also currently writes for the internet journal artcritical.com and teaches at Pratt Institute and the Parsons School of Design. The impulse to create religious imagery is as old as human spirituality itself. In the picturing of sacred figures and their stories, we can read the human yearning for contact with the ancient wellsprings of our communion with the divine, conveyed with compelling visual immediacy. In his Torah Series, Scott Switzer has created an evocation of the first five books of the Hebrew Bible, in an expansive series of fifty-four paintings. Each of the canvases represents the portion read each week in a Jewish synagogue, with the works grouped in six grids of nine paintings each. Switzer has created a structure for us to experience both the dramatic sweep of the Torah and a sense of the yearly cycle of devotion that the readings embody. John Mendelsohn is a painter based in New York who has written articles and reviews on contemporary art for Sculpture Magazine, d’Art International, ArtNet, Cover Magazine and The Jewish Quarterly Review (London), as well as essays for exhibition catalogues. He contributed to The Book of Symbols: Reflections on Archetypal Images, published by Taschen. He teaches in the Studio Art Program at Fairfield University.